The Web's Most Popular Place to Buy Wainscoting! A NEW SPIN ON TRADITIONAL WAINSCOTING! In the days before paint was scrubbable and wallpaper was mass-produced, wainscoted walls served a practical purpose; covering the lowest and most vulnerable portion of a wall. Covering with wood paneling provided an attractive and decorative wall treatment tough enough to withstand cleaning and resist any damages due to everyday use. Even with today's modern paint and wallpapers, wainscoting still serves its intended protective purpose; however people use it most often because of the way it transforms a bland space into an elegant room by adding interesting detail to walls that don't otherwise have any built-in character. Sure, that all sounds reasonable until you start to consider the cost. Until recently the trouble was, if you wanted wainscoting you either had to make-do by faking the look with trim applied directly to the wall or spend a lot of money on a custom carpenter and custom-shaped panels. Now with high speed production techniques and modern, precision made MDF or Hardwood panels, Elite Trimworks makes installing your own paneled wainscoting a more viable option. When choosing, you should consider which wainscoting is right for your application - have a closer look at your options. Keep in mind that we have experienced personnel standing by to answer any questions that you may have. To give you a better idea of what to expect, Elite Trimworks offers Wainscot samples for $15. Click to view or to order Wainscot Samples. 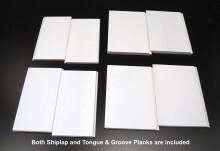 If you like for look of Beadboard, you'll appreciate our extensive offering of Beadboard Kits, Beaded Planks or Sheets. You can also view Appliques (picture frame or shadow box) systems. 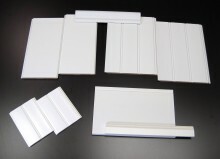 We offer several types of wainscoting kits that save time and money on the job site. Watch either of our step by step videos or browse through our how to section. All our wainscot and beadboard kits are packaged and shipped in eight foot sections. Our unique eight foot packaging, allows us to offer amazing shipping specials - have a look! For those who are concerned about off-gassing of formaldehyde from MDF, all our Wainscoting and Beadboard Kits are made with Low Formaldehyde MDF that qualifies for LEED Credits ...More.